It is officially the holiday season…a time to eat, drink, & be merry with family and friends and to honor the various religious observations that we hold so dear. It is also a time in which giving is at its greatest. This year, West Jackson residents Melvin & Monique Davis–who also happen to own Lumpkins BBQ–are teaming up with the Mississippi Community Education Center and Pippin & Maxx Arts and Entertainment to host a fundraiser for the holidays. This fundraiser, however, isn’t geared towards purchasing toys for the holidays. 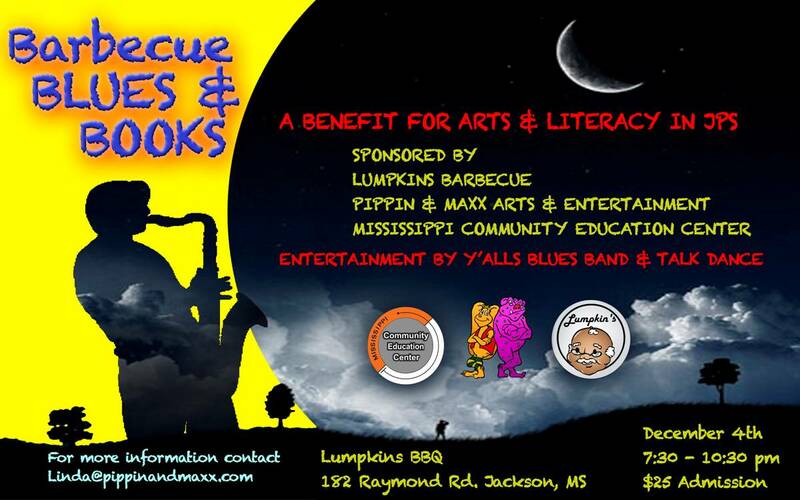 It’s purpose is to support Arts & Literacy programs in the Jackson Public School district and is aptly named BBQ, Blues and Books. BBQ, Blues and Books will take place this Saturday, December 4th, from 7:30 pm – 10:30 pm at Lumpkins BBQ (182 Raymond Road). The event features live entertainment by Y’all’s Blues Band. Admission is a tax-deductible $25. All proceeds go to the Mississippi Community Education Center. Oh, and don’t worry…you’ll still be able to eat, drink, and be merry while topping it all off by supporting a good cause. For more information, email linda@pippinandmaxx.com. You can also visit the event’s Facebook Page.